Flight booking offer on Easemytrip is going to expire today. If you won’t be avail that offer, worry not because we have a better offer for you. Now, you can get up to Rs 1200 discount on domestic flight ticket bookings with Yatra. It’s a limited period offer. So, hurry up. 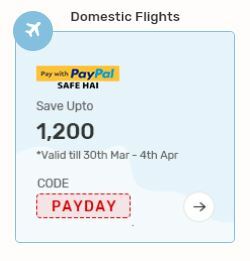 How to Get up to Rs 1200 discount on domestic flight ticket bookings? 1. First of all, go to Yatra. 2. Enter source, destination, date and other details >> Search. 3. Look for your flight in the search results >> Book. 4. Enter traveler details and other details that are asked. 6. Proceed to Payment >> Complete the payment with PayPal. 7. Voila!!! Your payment will be made and the ticket(s) will be booked. Paypal cashback has a validity of 60 days. The offer is valid between March 30, 2019 – April 4, 2019. Cashback Offer can be availed only once per PayPal user. Offer across Yatra Website, Mobile site & Apps. Valid only once per Yatra user.